Yesterday I started work on a new type of engine. 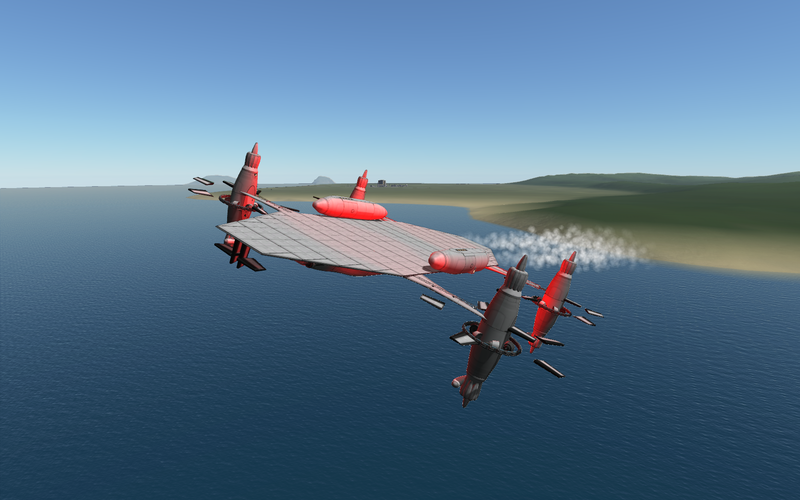 Today I have a helicarrier. Someone expressed his need for a tiltrotor engine for his massive, very heavy cargo plane. So I started work and surprisingly fast I had one running. This engine has 6 blowers producing 111kN static thrust. The propeller/rotor produces a whopping 1720kN! The next logical step was something like this. Taking off: Best done at 90% throttle. I could add even more air intakes but part count is already high. Hover is done at ~80% throttle.That throttle setting is also the best to start the forward propulsion. There are four Goliaths at your disposal (action groups 2 and 3). Don’t start all four of them at the same time. Cruise: either use the docking ports on the deck and radial out (there are multiple angles) or fly normally. I discovered Pilot Assistant doesn’t understand this craft - it can hold pitch and climb rate but a heading or bank makes it go all over the place. Landing: do it gently at max 2m/s. This big baby can land and take off from water but you have to minimize forward motion and keep it as level as possible. Out of fuel: make sure you have enough forward motion and/or altitude. Pitch down to pick up/maintain speed and pull up just above the ground like a normal airplane. Engines: Vapula version 1; 6x Wheesley blowers, rotor output 1720kN. Max gross weight: 588t, fuel tanks full, 58830 units of fuel - not recommended. Standard weight: 484t, 38010 units of fuel. Top speed: ~100m/s with 9000 units of fuel remaining.